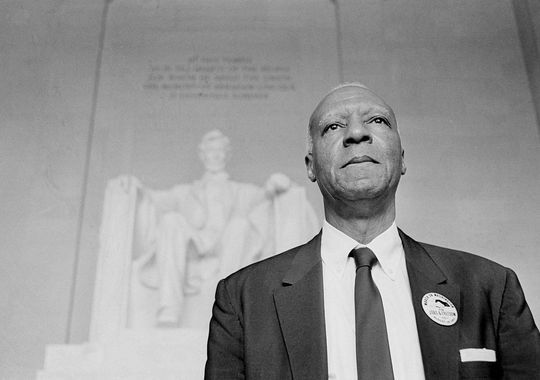 Today the IAM & TCU say, “happy birthday!” to our Brother Asa Philip Randolph a labor leader and social activist born on April 15, 1889. Randolph founded the Brotherhood of Sleeping Car Porters on August 25, 1925. Serving as its president, he sought to gain the union’s inclusion in the American Federation of Labor, the affiliates of which, at that time, frequently barred African Americans from membership. The Brotherhood of Sleeping Car Porters struggled with the Pullman Company, which was the largest employer of blacks at that time, and finally won recognition in 1925. But Randolph had an even bigger battle to fight with the AFL and George Meany. He battled on, and in 1937, won membership in the AFL. The Sleeping Car Porters merged in 1978 with the Brotherhood of Railway and Airline Clerks, now known as the Transportation Communications Union which merged with the IAM in 2012. The IAM is also an affiliate of the A. Philip Randolph Institute (APRI), the senior AFL-CIO constituency group working for economic justice and employment rights. Written by IAM Government Employees Department Director James Price, a board member of the A. Philip Randolph Institute.